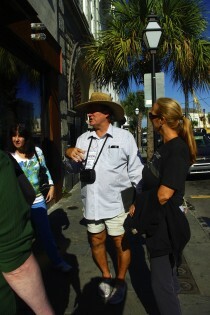 You know you are getting real Charleston when your tour guide’s name is “Hoon” Calhoun. I had the pleasure of joining one of his Chef’s Kitchens Culinary Tours Thursday morning and it was way beyond what I expected. Our group of eight went straight to Glazed, essentially donut heaven, where we drank coffee and sampled maple-bacon, sweet potato, and raspberry donuts. The owner’s mom, Mary Smith, talked to us about how they started the business and the challenges involved in making yeasted doughs from scratch. Hoon started in on the history of the lowcountry rice plantations and along the way gave solemn remembrance to the slaves who did that backbreaking work, describing in great detail the labor that went into preparing the land and irrigating the crops. His storytelling was so powerful that several of us got verklempt. Our next stop was at HoM, where Executive Chef Shay MacDonald talked about how nice it is to be a burger place that is known for its calamari and falafel, as well as their tricked-out gourmet patty creations. From there, we went to Prohibition to chat with chef Stephen Thompson about how he does his purveying and we watched him expertly filet a trout in his tiny kitchen. The tour ended with a stop at Virginia’s on King, where Hoon did a Scarlet O’Hara impression so impassioned about the sweet potato, tears were embarrassingly welling up again. They served a couple of snacks as we learned how his mom makes her coveted chicken salad, and about the history of southern foods from grits and Hoppin’ John to syllabub. This is an experience as much for the history buff as the gourmand, and it was as much fun for this local girl as it was for any visitor. Posted on November 6, 2013 by admin.